If there’s one machine that almost all cardmakers love, it’s the Sizzix BIGKick. This crank-operated die cutter is a real pocket rocket when it comes to small cutting crafts — and at it’s famously low price, it’s a perfect gift for kids, beginner crafters and those on a budget. We’ll also introduce you to the cute and quirky Sizzix BIGKick Vintaj — a special edition machine that jewelry makers love. Let’s get one thing clear — the Sizzix BIGKick is for small crafts only. Its maximum cutting width is just a teeny tiny 6 inches. The standard cutting pads that come with the machine measure 8.75 inches long, but the extended multipurpose platform that also comes with it stretches out to 14.125 inches. Therefore, if you want to use the full length of the platform, you’ll need to buy extended pads as an additional purchase. The Sizzix BIGKick is a die cutting and embossing machine, which makes it perfect for card makers, scrapbookers and other small scale crafts. You’ll need to buy dies and embossing folders separately, but thankfully the machine works with all the ones you already have so you won’t need to go out and buy only Sizzix compliant new ones if you’re moving over from the Cricut Cuttlebug, for instance. We love that easy to use versatility that makes it easy to switch between brands. Certain dies are best suited to certain materials. 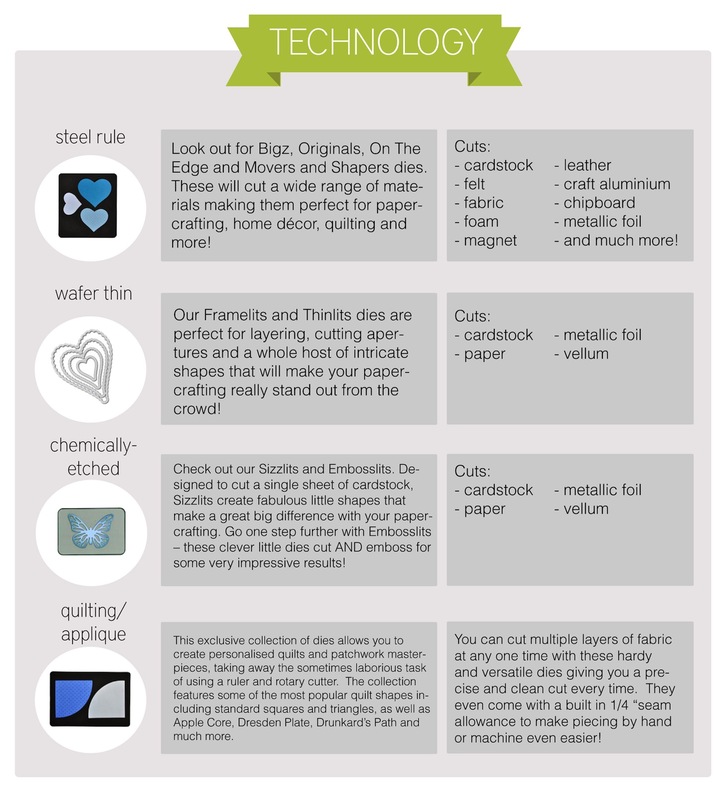 This Sizzix infographic shows what dies are best for your favorite materials and cutting methods. Also on offer is the Sizzix Vintaj BIGKick machine: a special edition product created to help you to cut, emboss and etch jewelry designs. We’ll cover everything Vintaj below. If there’s one thing to be said for the Sizzix BIGKick, it’s that it’s super easy to use. We’re talking a three step process from start to finish as you create a sandwich out of your cutting pads, die and material, feed the sandwich through the machine and crank it out the other side. For those of you looking for something a little different, check out the Sizzix special edition BIGKick Vintaj. This beautiful machine not only has a cute vintage look, but it’s been specially designed in conjunction with Vintaj to be used by jewelry makers. As well as being able to do everything that the standard BIGKick can do, it also allows you to emboss and etch gorgeous designs onto Vintaj’s jewelry blanks, for you to make an array of beautiful pieces with. For those who don’t know, a shim is like a piece of padding that will make your sandwich thick enough for it to be cut accurately by the BIGKick — an important tool for jewelry makers. The shim means that the BIGKick Vintaj is compatible with most of the designs in the Sizzix library. As well as making jewelry with the BIGKick Vintaj, you can also create 3d art, cards and anything else you think you can emboss with! If you’re designing on metal, we suggest either sticking to the Vintaj jewelry blanks, or using only thin and malleable metals, in order to ensure the best results and no damage to your machine. You’ll want to buy DecoEtch and DecoEmboss dies to pair with this machine — there are some beautiful patterns and designs to choose from. Just like the original BIGKick, the Vintaj special edition is really easy and intuitive to use. The truth is… there’s not a lot of difference between them. Some crafters actually contend that they’re almost exactly the same machine. While they’re certainly used for the same purpose, there are a couple of small differences. The current edition of the popular Big Shot is white and gray in appearance. The BIGKick, however, is decked out in a periwinkle blue and the BIGKick Vintaj boasts an intriguing caramel and toffee color scheme with a crazy pattern on the body. Which one you prefer is entirely subjective. Personally, we like the sleek and understated appearance of the Big Shot, but many of our crafting buddies prefer the bright colors of the BIGKick range. Obviously, the BIGKick Vintaj has been designed to be used in conjunction with the specialist dies and folders from Vintaj, but the truth is that you can buy these dies and folders from Vintaj anyway and use them in your Big Shot without any problem. The one other difference between the BIGKick and Big Shot is the fact that Sizzix have retired the BIGKick and are focused now only on promoting and improving the Big Shot. We assume that they realized customers were buying either one or the other of the machines so settled on the most popular and more expensive, the Big Shot. As such, the major difference between the machines is purely cosmetic. Which color scheme do you prefer? And do you mind paying a little more for the latest Big Shot? Now it’s time to get down to the nitty gritty. What’s good and what needs improving with the BIGKick? If you want a die cutter that’s quick to set up and intuitive to use, it’s hard to go wrong with the Sizzix BIGKick. There’s no buggy software to deal with, no wires to trip over and not even any electricity necessary — it really is as easy as loading up a sandwich and cranking it through the machine. Of course, the manual labor necessary to power the machine means that it’s not appropriate for those of us who like to create all day and all night, but for small scale crafts like card making and scrapbooking, you’ve got it made. This ease of use also means that it’s the perfect machine for both beginner crafters and children. At about 7.5lbs, the Sizzix BIGKick is definitely a light and portable machine, but it can also hold its own against most materials you try to throw at it. It’s best to ensure that you keep your materials on the thin side, and that any metals are malleable enough to be readily embossed or etched, but it is heavy duty enough to handle what it says it can. Some users have complained that their machine broke or faulted after only a few uses, but it quickly becomes clear that this was due to overloading it with a super thick or super hard material. We found that the BIGKick performed well, as long as you keep the material thickness low. Speaking of materials, the BIGKick can handle pretty much anything you can think of when it comes to card and scrapbook making: even fabric, metals and metallic foils. This is particularly impressive given its low price point and the fact that you have to power the machine via a hand crank — there’s no automatic material settings available here (hello, Explore Air 2 and Cameo 3!). Of course, it doesn’t just cut either: it’s very adept at embossing and etching, and an all-round great tool for jewelry creation and other such artwork. We never love a product unconditionally at VCM and, as you might expect for such a cheap price, there are a few issues with the Sizzix BIGKick that you should be aware of before you buy. The truth is, it isn’t that different. Aside from a different color scheme, the BIGKick, the BIGKick Vintaj and the Big Shot are all essentially the same machine. That doesn’t make the BIGKick a bad machine, but it does mean that there’s not much point to buying it if you already have the Big Shot. If you’re wondering whether it’s worth buying the BIGKick Vintaj in order to start making jewelry but you’ve already got the BIGKick or the Big Shot, we’d advise you to just buy the special Vintaj jewelry blanks and DecoEmboss & DecoEtch dies, and use them in your current machine. If you don’t own a Big Shot and are wondering which Sizzix machine to buy, the best way to choose between them is to pick which machine’s appearance you like the best. Seriously. One of the best things about the Sizzix BIGKick is the fact that it’s very reasonably priced. But if you think that you’re all set and ready to go once you’ve bought the machine, you might be a little disappointed. First off, you’ll need to buy the dies and embossing folders you want to use. And if you want your creations to be as long as the extended multipurpose platform (14.125 inches), you’ll need to buy some extended cutting pads as the ones that are included are only 8.75 inches long. This may sound a little silly and truthfully, we are nitpicking, but we wish the BIGKick had the foldable sides that the Cricut Cuttlebug sports so we could carry it around a little easier. The machine only weighs about 7.5 lbs but it’s pretty wide and not so easy to bundle up into a bag. Overall, we really like the Sizzix BIGKick and definitely consider it as one of the best hand-operated die cutters on the market. It’s cheap, reliable and versatile — and easy to use, too. We think it’s one of the best cutters on the market for kids, beginners, card makers and scrapbookers. Our only major reservation with the BIGKick is the fact that it’s so similar to the Big Shot — we’re not sure there’s any point in buying both of them as neither is really an upgrade on the other. But, if you haven’t got a Big Shot and are looking for a great die cutter, the BIGKick could well be the one for you. Sizzix have officially retired the BIGKick now so unfortunately you can’t buy it direct from their website. Thankfully, there are still plenty of other places to procure it online! And so that’s the Sizzix BIGKick and the BIGKick Vintaj! The Sizzix BIGKick is undoubtedly one of the best hand-operated die cutters on the market right now. It's cheap, easy to use and surprisingly versatile. There's very little difference between the BIGKick, BIGKick Vintaj and Big Shot. Which one you buy all boils down to which one you like the look of! Very new to all of this … thank you for your honest and complete review. I’ll buy one for my daughters. There are a zillion dies on eBay from China …. hopefully these will work with the machine. Primary use will be scrapbooks and cards. Later, I will revisit your site to learn more about all you offer. Thank you for this thorough review of these machines. I’m late in the game and recently saw the Vintaj and fell in love… but they aren’t available anymore! So I am really happy to know I can still use the Big Shot just the same.